TAIPEI (Taiwan News) — Images of a Chinese propaganda poster preaching against “religious extremism” which bizarrely includes a photo of Hawaiian-Canadian actor Keanu Reeves suddenly started to go viral on social media yesterday (Nov. 22). 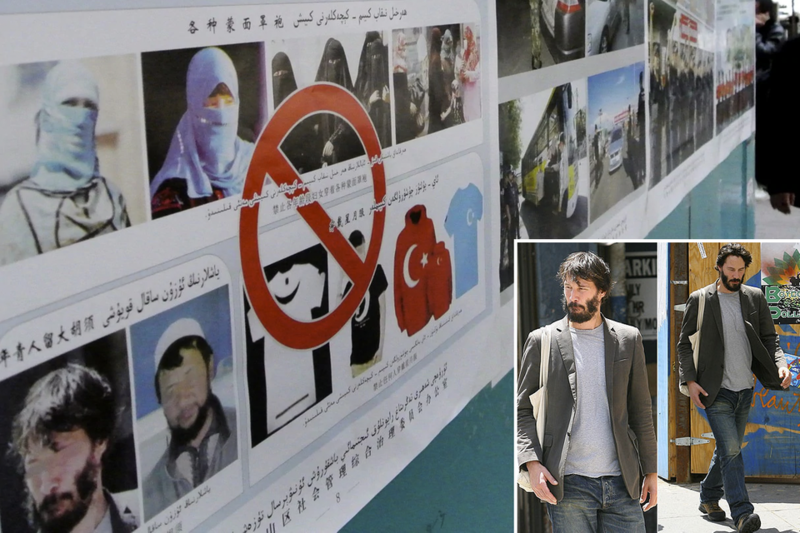 In the original poster, which was taken in Xinjiang’s capital city of Urumqi, a “no symbol” is imposed over images of women wearing veils, clothing with the star and crescent, and men with beards. 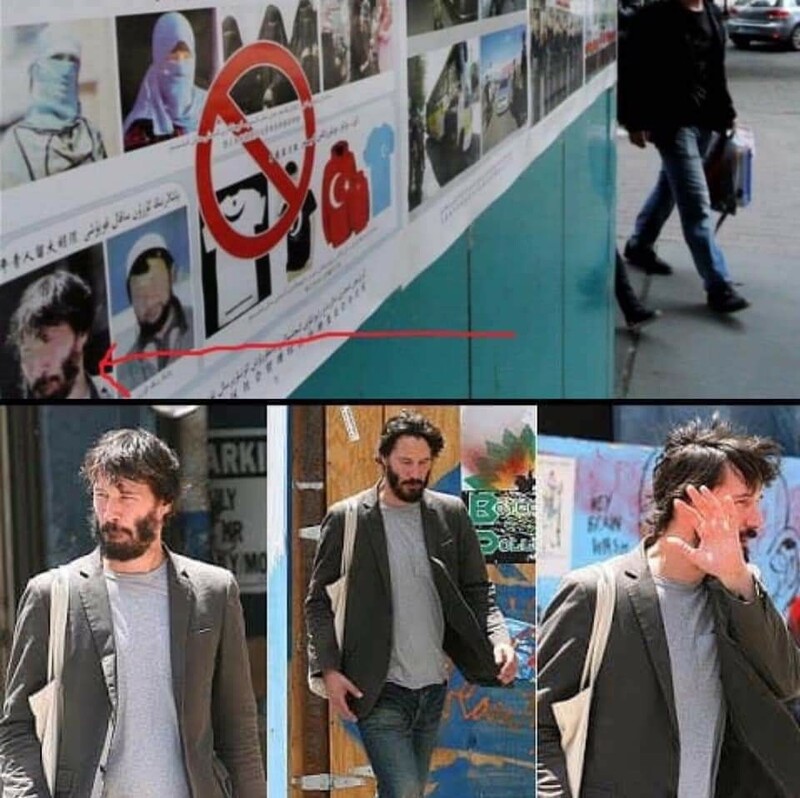 For unknown reasons, the Chinese propagandists who concocted the poster included a photo of Reeves with a beard that became the popular meme “Keanu Reeves is still sad” in 2010 to present as an example of facial hair that is unacceptable. Above the 54-year-old actor’s image, the Chinese text reads, “Young people who grow big beards,” as an example of “religious extremism.” Though the photograph of the poster first surfaced at least as far back as October 2014 on the Twitter account @E_Turkistan, it is only this week that it has gone viral on social media for its connection with Reeves. Any Uyghur who has beard the local authorities immediately label him as extremist and terrorist. Scarcely five minutes later, a user on Reddit posted a similar collage of images of “sad Keanu” and the Chinese propaganda poster. The title of the post read, “KeanuBeingAwesome doesn’t want you to see this photo of international terrorist Keanu Reeves,” in reference to a “subreddit” on the social media platform dedicated to the star. On a more serious note, a United Nations human rights panel in August reported that up to one million Uighur Muslims have been forced to live in what resemble internment camps. A member of the UN Committee on the Elimination of Racial Discrimination describes the facilities the Uighurs and other Muslim minorities are forced to stay in as “political camps for indoctrination,” reported Al Jazeera. Several former detainees, in conversations with The Independent, revealed they were subjected to endless torture and humiliation, brainwashing, and physical abuse. This included being forced to eat pork and drink alcohol while renouncing their religion, writing daily self-criticisms, and swearing allegiance to the Communist Party. 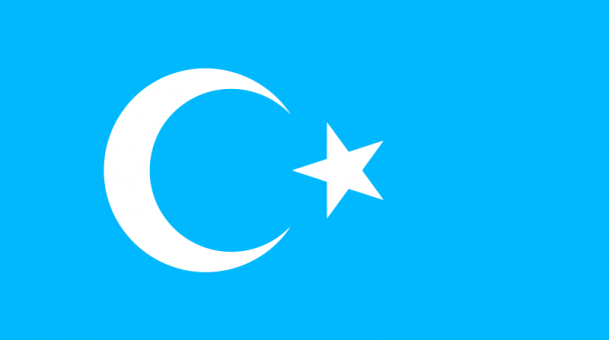 The international community has continued to lambast China for its treatment of Uighur minority citizens, with ambassadors of 15 different countries penning a petition on Friday (Nov. 16) to meet with Communist Party Chairman Chen Quanguo over the issue.